Pro-Tech Systems based in Rotherham recently launched their new website. The new website allows you to see more photos, sample prices and detailed descriptions of the security fencing and related products they offer. With 25 years experience of manufacturing, supplying and installing security fencing they have a reputation to be proud of, and look set to continue being a leading supplier. 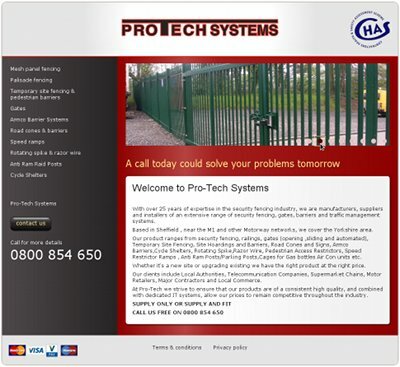 Pro-Tech recently expanded in to affordable cycle shelters and have a range of other products such as gates, speed ramps, and razor wire.